A collection of notes on the method of purchase, manufacture, and inspection of shoes and shoe lasts in the US army during World War I. This book was originally commissioned under the auspices of the quartermaster General of the United States Army for the benefit of officers and the quartermaster corps. This fascinating volume will appeal to those with an interest in historical shoe and boot production, and particularly its importance from a military standpoint. Contents include: “Historical Sketch”, “Scope of Subject”, “Knowledge of Needs of the Army”, “Tariff of Sizes”, “Knowledge of Material”, “Cost of Materials”, “Opportune Time for Purchasing”, “Cost of Manufacture”, “Overhead”, “Advantages to Purchasing Officer of Above Knowledge”, “Purchase of Lasts”, “Knowledge of Factory Conditions”, etc. Many vintage books such as this are becoming increasingly scarce and expensive. We are republishing this volume now in an affordable, modern, high-quality addition complete with a specially commissioned new introduction on the history of shoemaking. 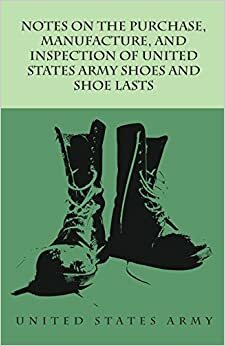 Notes on the Purchase, Manufacture, and Inspection of United States Army Shoes and Shoe Lasts Anon. now. You are so intelligent. You realize thus significantly in relation to this subject, made me individually consider it from numerous varied angles. Its like men and women aren't fascinated until it is something to accomplish with Lady gaga!